Fire can destroy your home in minutes. A house fire doubles in size roughly every 60 seconds, so every second counts. Standard smoke detectors may alert you to a fire when you are in the house, but they offer very little protection when you’re out of earshot. What happens when you are fast asleep, shopping, on holiday or simply away from your home? By the time a well-meaning neighbour has established it is not a false alarm, your house could be burnt to the ground and your personal possessions all lost. 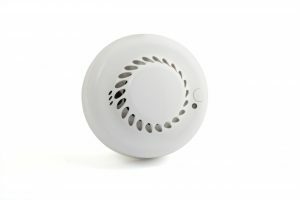 FireGUARDIAN is an intelligent smoke and fire detection system which communicates to a central hub located within your home. In the event of activation the hub will alert the alarm receiving centre, which is manned by experts trained in dealing with emergencies, and the fire brigade can be dispatched to your home if needed. False alarms are now a thing of the past as the FireGUARDIAN works by detecting heat, not smoke, and will only trigger if there is a rapid rise in heat temperature, something that only a real fire can create.